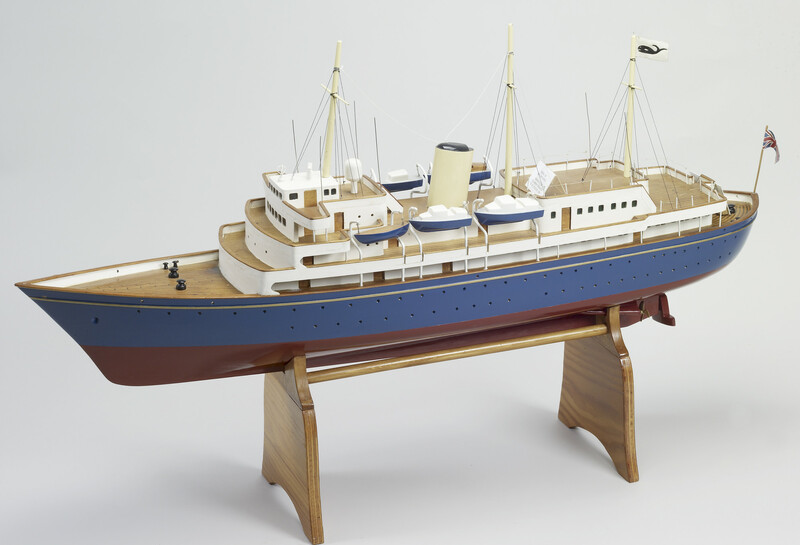 A large painted model of HMY Britannia made on the Caribbean island of Bequia. Three masts with large central funnel, Union Jack at front and Ensign at the rear. Three life boats hung on each side of deck level. Mounted on a wood stand. HMY Britannia was built by John Brown & Co. Ltd on Clydebank and launched by The Queen in April 1953. The Queen and The Duke of Edinburgh undertook the final homeward journey on the Commonwealth Tour, from Malta to London, on board Britannia. Subsequently Britannia was used on many tours to Commonwealth countries, enabling visits to distant and otherwise inaccessible islands, and providing a royal residence at sea, where official receptions and dinners could be held. Before her decommission in 1997, Britannia conveyed The Queen, other members of the Royal Family and many dignitaries on 696 foreign visits and 272 visits in British waters.